I thought it was time to show you more Georgia portraits by various photographers. 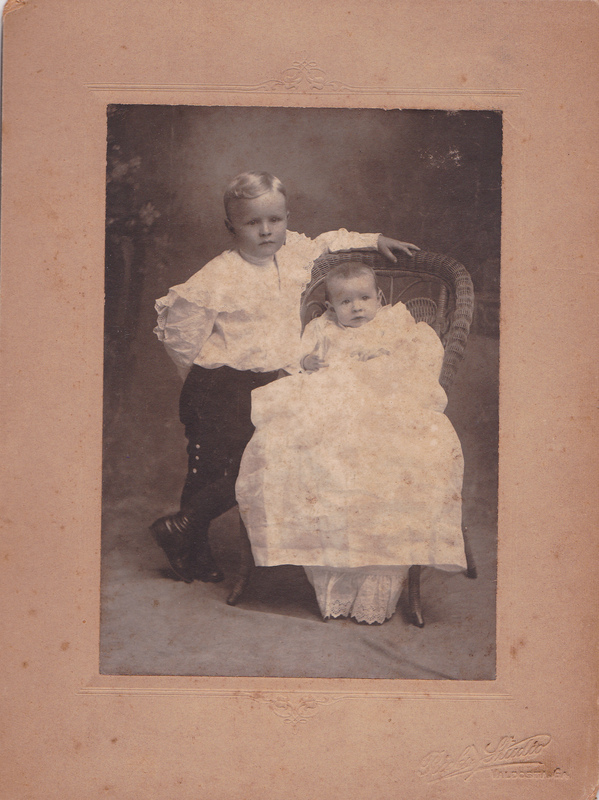 The following are only some of the cartes de visite, cabinet cards, and other card photos from my collection that depict siblings – sisters, brothers, and of course, brothers and sisters. If you have no interest in Georgia photographers, I hope you enjoy looking at their photographs. The biographical information I give on these photographers is only a small portion of what I have on each. If you have any questions regarding them, or their subjects, please contact me. The photographer of the image above, J. W. (Jabez Whiting) Perkins, had a long career as a photographer in Georgia. He was born about 1828 in Connecticut, was a daguerreotypist in Florida by at least 1850, and worked as a resident photographer in five Georgia cities (Augusta, Macon, Savannah, Covington, and Atlanta) from 1851-1897. Perkins is another of those northern businessmen working in the South who served in the Confederate army. Perkins had a number of partners during his career, but the most well known is his partnership with Isaac Tucker. As Tucker & Perkins their partnership lasted, sporadically, from 1852 to 1861. They worked primarily in Augusta and Savannah, and briefly in Columbus. The carte de viste above was made when Perkins worked alone at 194 Broad Street in Augusta. 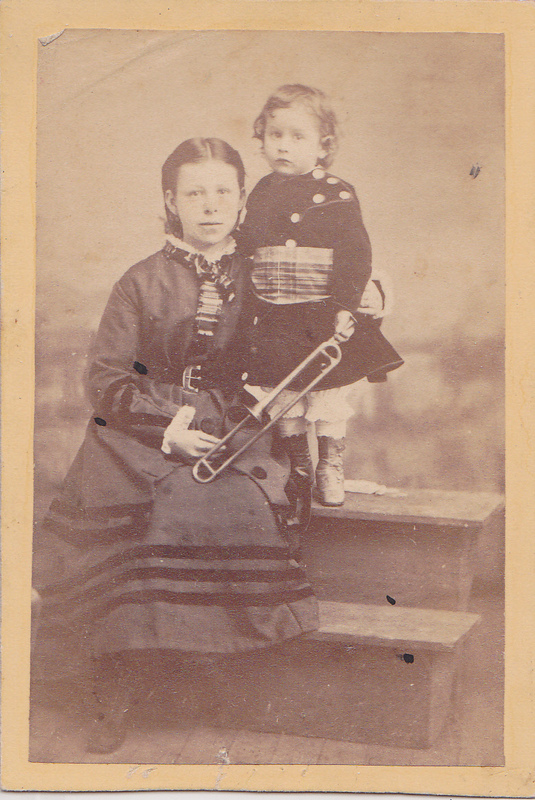 The siblings sit on two levels of a step prop; the older sister holds onto her little brother who holds a horn, probably a Perkins studio prop. Each child’s checks are tinted “rosey”, but the hand-tinting is barely discernible now. J. W. Perkins’ son, William R. Perkins, was also a photographer in Georgia, 1880 – 1909, sometimes working with his father. Following an attempted suicide and a stay in the Milledgeville (Georgia) sanitarium, he worked as a photographer in Cincinnati, Ohio by 1920, but was operating a boarding house there by 1930. These two little girls, photographed by J. N. Wilson, are marked as his negative numbers 7403 and 7404. I mentioned Wilson (1827 – 1897) and his work in Savannah briefly in my 2013 Veteran’s Day post http://wp.me/p3wX4F-cW and in a Monday Musings http://wp.me/p3wX4F-eQ I really will write about him in more detail one of these days! Although some stereoviews have been attributed to him as early as ca. 1862, thus far the first advertisement I’ve found for Wilson as a Savannah photographer is in the Savannah Daily Herald on Oct. 9, 1865, when he advertised his Photographs and Ambrotypes. He first appeared in the Savannah city directories in 1866. I believe he is the Jerome N. Wilson who served on the Georgia coast with 1st Battalion GA Cavalry from August 1861 until early 1863, so it is possible those earlier images were made at that time. Wilson had a series of partners off and on throughout his career, including James A. Palmer, O.P. Havens, Michael Vaughan (probably his brother-in-law), and at the end of his life, Martin Royall. His son Michael Edward Wilson took over and expanded the photography business after his father’s death. 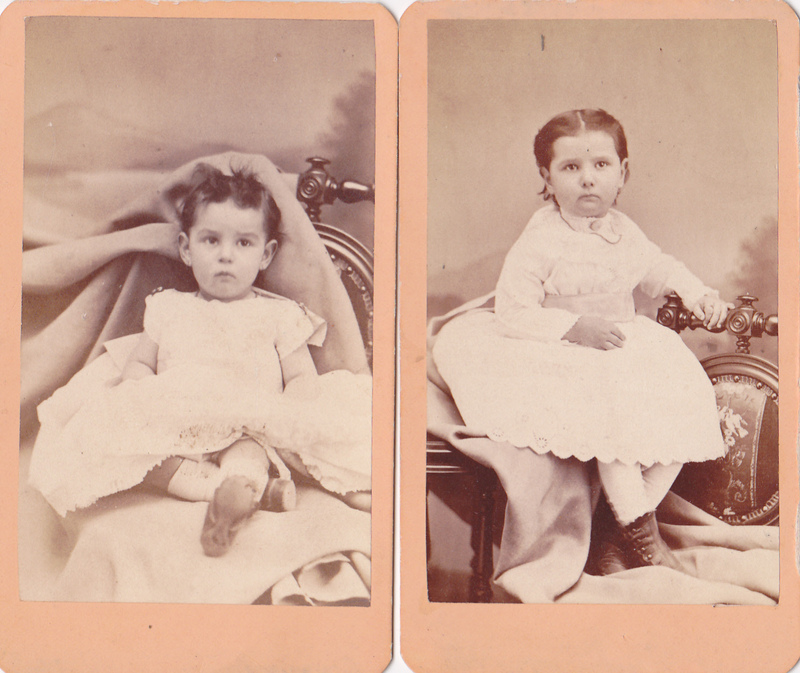 These three images were sold to me as a group, and identified by the seller as siblings, although this boy, who I do believe is the girls’ brother (look at those six pale eyes! ), is barefoot, and they are not. 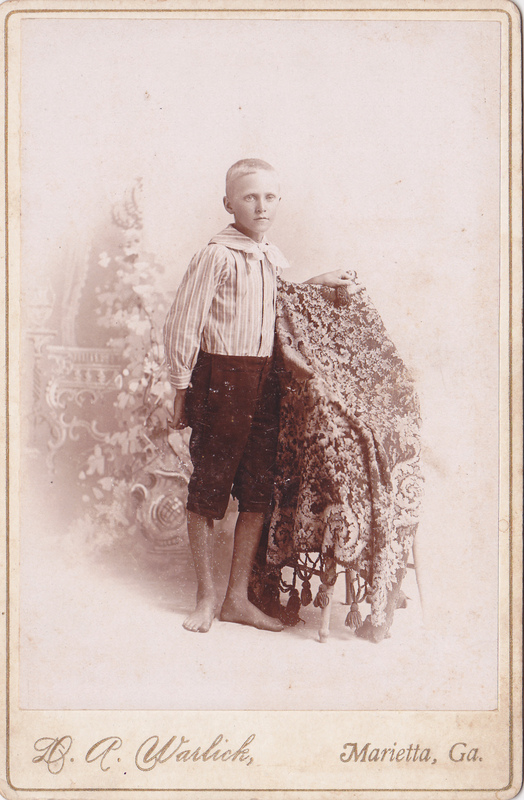 Notice the same backdrop is used for his photograph, and a chair, although not a rocking chair, and a similar pose is used in his photograph as well. Perhaps because boys were allowed much more freedom than girls, those “bad boys” might be portrayed barefoot, a la Huck Finn. You probably would not see a barefoot girl in a studio photograph, but I have seen a barefoot “country” girl photographed by an itinerant photographer. David Absalom Warlick (born either 1855, per his grave marker, or 1856, per his death certificate) worked in Marietta, Georgia ca. 1875 – 1900. Then he purchased a studio in Griffin, and possibly one in Barnesville, where he worked until 1910. His next move was to Macon where he worked as a photographer until his death. While in Marietta, Warlick had partners including a jeweler named Samuel G. Mozley, another man named McConnell, and briefly a brother. I have more research to do on these partnerships. D. A. Warlick’s younger son Lewis worked for him for a short time in Macon around 1910. 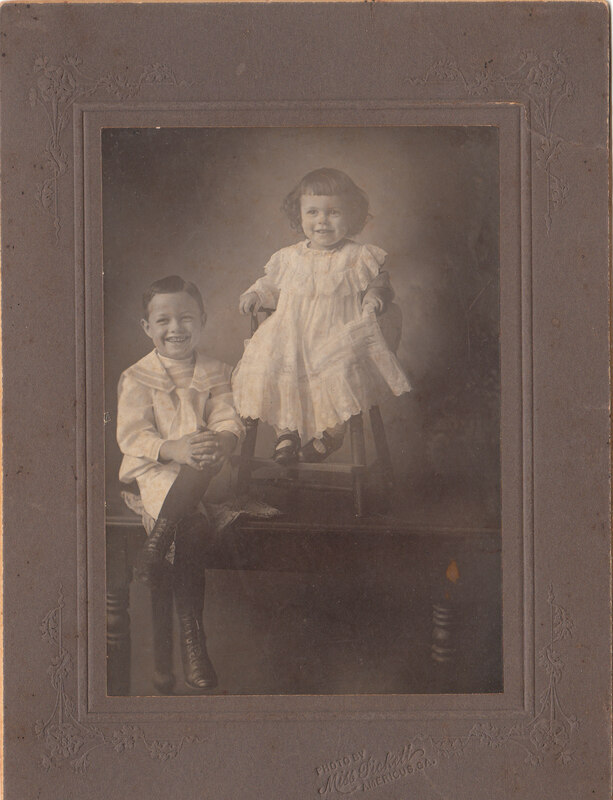 His older son H. C. (Hillyer Clarence) worked for his father by 1900, in Marietta, and he carried on the Macon photography studio when his father died in 1927. The Tomlinson brothers were from Lake Butler, Florida, and were either visiting Valdosta or were brought across the state line to have their picture made in the studio of W. L. Ricks. William L. Ricks (1876 – 1962) had a photography studio in that city from about 1900 until at least 1940. He also ran a studio in nearby Quitman, GA, where he may have been born, from about 1900 to 1905. W. L. Ricks was an enterprising man. He was active with, and an officer in, the Tri-State Photographers’ Association. 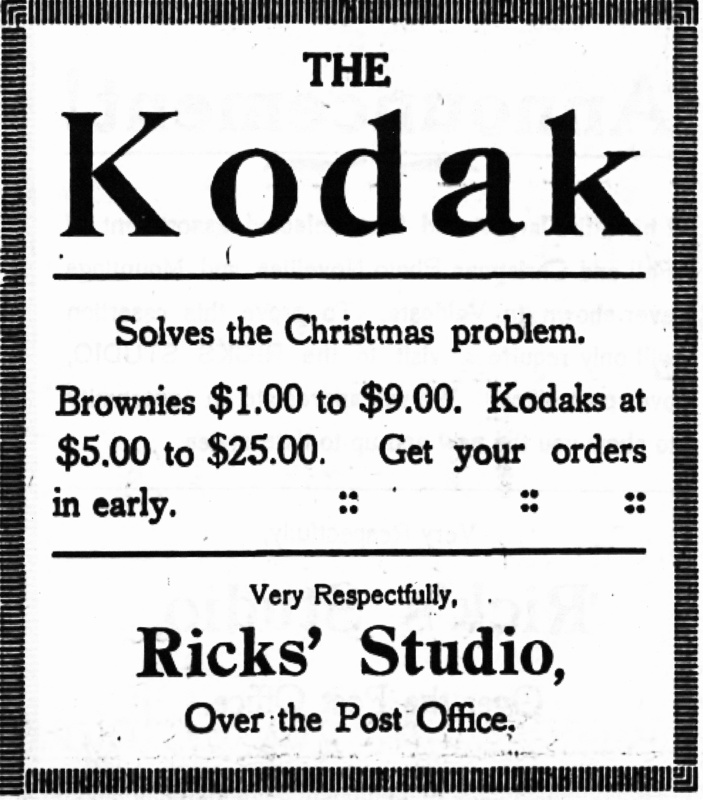 He also ran Ricks Printing Co. and advertised as a “printer & bill poster” ca. 1905. In 1911 he had a three-year lease on a theater on the second floor of city hall, but he lost it in 1912. In Valdosta his sister Ethel (b. 1880) assisted him in the Studio from about 1905 – 1915, and his son Charles assisted him, ca. 1930 to 1940; W. L.’s wife Margaret asssisted him at least in 1940, perhaps longer. Ethel moved to Atlanta by 1919 and worked as a photographer for the Alfa Lomax Studio until 1930; after that she managed an apartment building. In about 1938 Ethel moved to Florida where she lived to the grand age of 94. I will close this post with a favorite photograph. This one is made by another woman photographer, Miss A. L. Pickett (Annie Lizzie Pickett, 1863 – 1949) of Americus. She was a milliner in Americus (1887 – 1895), before becoming a photographer. She remained a photographer until about 1908. I plan to do a more detailed post this year on the various women working in photography in Georgia (I’ve thus far recorded over 165, including a few visiting photographers). I was going to leave this Miss Pickett photograph out of this post for that reason, but I could not. The simplicity of the pose is refreshing, and this is the work of a woman who knew how to bring out the best in a child. These children are actually, very definitely smiling! Thank you for the complement, Fred. I have been away at a Symposium but will try to catch up in the next few days and look at the images. I noted you posted my hand-tinted D&M so I will check and make sure that link works! I have an old photo that has ” Harry Death” Covington, GA stamped on it. It is a portrait of my great uncle and IS NOT a funeral photo. I cannot find any info on a photographer in Covington by that name. Any info you could give would be greatly appreciated. Thank you Dixie Kinney Savage, researching Bailey, Worsham and Jordan of Jackson, Newton area. Thank you. Yes, Mr. Death was a photographer in Covington. I wrote about him in a Halloween post! In the search box at top right of this page enter “harry death” and it will pull up that post. If you need more info, contact me again. I was going through some very old pictures that belonged to my mother-in-law in Marietta, GA and ran across a picture by D A Warlick and it has Marietta, GA on it. There is no identification on the photograph except Mr Warlick’s name and this city. I would guess the late 19th century. I don’t suppose there are any records left anywhere? Thanks for reading. I can give you dates that Mr. Warlick worked in Marietta, the only records I am aware of are the usual vital records for birth, marriage, and death. I have not done research on the Warlicks in quite awhile, so you may find more records. I would assume your photo dates from 1885-1900. D. A. (David Absolom) Warlick (1855-1927) worked in Marietta ca. 1875 – Dec. 1900. From Jan. 1882 – Nov. 1883 he was @ Mozley & Warlick; from Dec. 1883 – ca. June 1885 he was @ Warlick & McConnell; from July 1885 – 1900 as D.A. 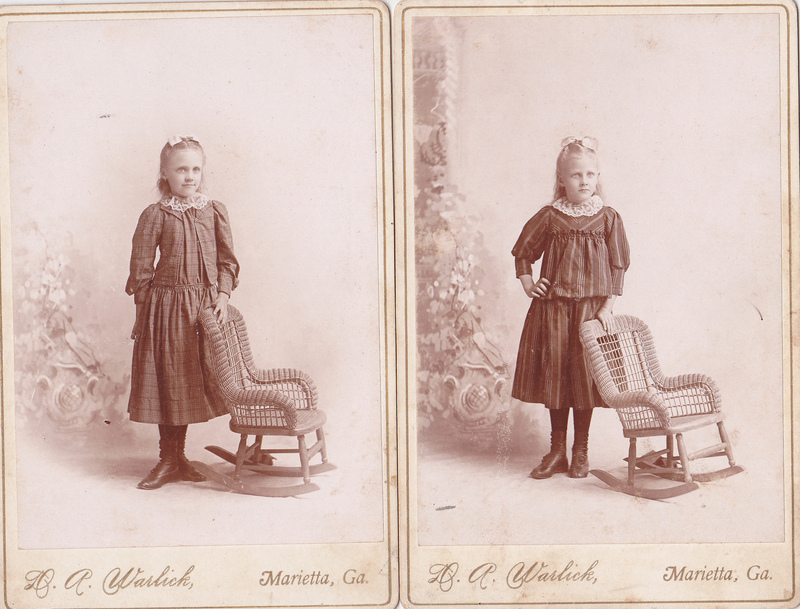 Warlick (briefly as D. A. Warlick & Bro., ca. 1890-95); his son H.C. (Hllyar Clarence) Warlick (1883-1973) worked with him in Marietta in 1900, before moving on to work on his own. Thank you for sharing this information. I also recently found an old family photograph labeled D.A. Warlick, Marietta, GA. I presume it was from the period 1885-1900 as you mentioned above. Do you know if it was unusual for photographers at that time to take pictures of both White and Black subjects? The picture I have is of an African American lady. Hi there, Contrary to what many believe, many white studio photographers also had African American customers. See my June 2015 post Tuesday Thoughts and Touching Base about a conference at UVA where I spoke on that subject. Also look at my post on a black photographer named Pepper who had white customers as well as black. I recently bought a cabinet card of a black gentleman made by J.N. Wilson, a prominent white photographer of Savannah, GA.
What an interesting blog you have! Thanks so much! I need to get back to posting more regularly again. I have a photo of (possibly) my great-grandmother and her brother or my great-great grandmother and her husband. Most likely the first ones as my great-great grandfather was killed during the War Between the States in about 1864-65. The photographer was D A Warlick, Griffin, GA. They resided in Henry Co, GA from 1860s until about 1880s. Do you have any information as to when he may have had a studio in Griffin, GA? There are no identifying names on the photo but the Lowey family were the only ones in that area. I am contacting you via email re D.A. Warlick. He was in Griffin later, as you see by my post. I have some ideas as to why your relatives may have traveled from Henry County to his studio elsewhere. How interesting! I have nothing like that in my collection, usually only “negative available” on them!